I was intrigued to buy “The Twenty Days of Turin” by Giorgio De Maria after an enticing preview by our friends over at the ‘This is Horror’ site. After then discovering an absolutely fascinating interview with the translator Ramon Glazov over at the ‘Weird Fiction Review’ I was sold – hook, line, and sinker. 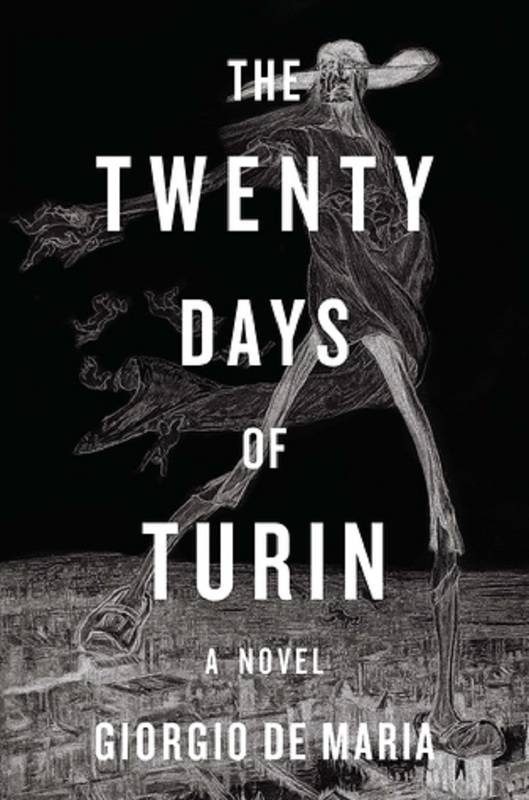 I’ve been around weird fiction for more years that I can remember and I cannot ever remember hearing of “The Twenty Days of Turin” which has just been published in English and in the USA for the first time in May 2017. A mere forty years after its first publication in Italy! Yes, you read that right, forty years. An especially long period of time for a book critics are now comparing to Poe, Kafka and Lovecraft….. There really isn’t much around on the internet about this highly strange novel, which apparently has some sort of cult reputation in Italy. However, I’ve asked a few Italian literature experts I know and nobody has heard or knows much about it. The translator Glazov is somewhat of a Giorgio De Maria expert and his ‘Translator’s Introduction’ is particularly revealing and compliments the novel perfectly. The author himself is a real enigma, and his life had just as many odds twists as the novel itself. You’ll be looking the guy up on Wikipedia in no time. De Maria only wrote four novels between 1968 and 1977, of which “Twenty Days” was his last. A few years later he became a committed Catholic and never wrote again, dying in 2009 aged 85. Along the way he was a concert piano player, theatre critic, journalist and well known leftish culture vulture. So what of this truly bizarre novel? An amateur researcher investigates the weird events which have since become known as ‘Twenty Days in Turin’ ten years after the fact. He hopes to write a book on this almost hypnotic psychosis which led to many of the residents of Turin suffering from insomnia and in turn wandering around the streets late at night. Whilst in this forgetful stupor some of them were attacked and murdered by something huge that picks them up by the ankles and bashes them to death against statues and walls. Nobody really knows what caused the deaths, but something supernatural or monstrous is suspected. Ten years later nobody likes to talk about these twenty days and as the bumbling researcher stumbles deeper into something he doesn’t understand and interviews the few suspicious survivors willing to talk to him. This short 150 page novel has a second major strand which I think has been over hyped and too much has been read into it. But it’s a great way of selling a pretty obscure novel though! Whatever your opinion, it is completely fascinating….. The translator Glazov argues that the novel seemed to predict, forty years in advance, the creation of Facebook, blogging and other areas of social media. How is this possible? This second story strand features ‘The Library’, a place where citizens could for a fee store (or donate) their personal writings or musings. These thoughts must be personal in nature and describe themselves. At the same time they are welcome to read the biographies and thoughts left by others. And for a nominal fee, they will be provided with the contact information of any of the authors, should they want to get in contact and have further communication. Sound familiar? Even William Gibson and other early steam-punk pioneers came this close to nailing social media as this idea does. Thing blogs…. Think Facebook posts….. Think of online stalking….. Think of buying information about someone online…. Think of internet trolls….. Thing of posting stuff and then never being able to delete it….. In one shape or form all these ideas are present in “Twenty Days”. Users of ‘The Library’ must only present unpublished work and have to pay to find out personal details of others they are interested in (buying personal details?) and eventually the equivalent of the Dark Net takes over and people just post nasty troll like stuff, there may of course be a demonic force at work. Although I enjoyed this book I think the reviews and blurbs have sold it to be more than it is and some readers may be a tad underwhelmed by it. Much of it is very obscure, you’re wandering in a labyrinth wondering what the hell is going on. However, it has got some incredibly unsettling scenes as the unnamed researcher digs deeper into the mystery. Apart from the quaint old tape recording equipment the novel has aged really well, but I wonder whether the crash, bang, quick fit generation will have the patience for it? Personally I enjoyed the intellectual challenge of it, but it will not be to all tastes. Is it a horror novel? Most definitely, a very literary example which also messes with Magical Realism. It’s claustrophobic, nightmarish, with a very dark take on religion with unsettling twists. It’s laced with paranoia, layered with symbolism, and the unnamed narrator slowly begins to wonder whether he is being played…. It messes with his head and this challenging freaky novel may well mess with yours also.